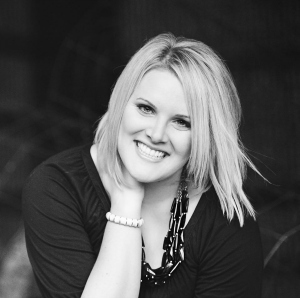 Life of Meg: Mingle Monday: Valentine's Edition! So glad you could join me on one of my favorite days of the year... Valentine's Day! I am a firm believer that Valentine's Day is for anyone and everyone. It's all about showing love to all the wonderful people in your life. So anyway, I hope you're here to help me crush the negativiity and spread the love! Whether you are a Mingle vetran or a wonderful newbie, let me personally welcome you to Mingle Monday, my weekly hosted blog hop. I couldn't be more happy that you stopped by to hang out on this fabulous Monday morning! Who's excited to Mingle it up? Let's get YOUR blog growing! Let's let everyone know how much fun we're having! Please pay it forward by using the button below in one of your posts today. 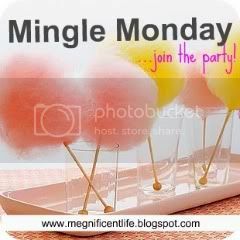 I can't tell you how much it MAKES MY DAY when I see posts with the Mingle Monday button in it... you guys are seriously the BEST! Thanks for hosting.... I will be back to browse when there are more blogs linked....I like to read while my kids are in bed! No plans, husband is on the road....thankful for all my loved ones! - Very thankful for my sweet family, always encouraging friends, snuggly puppy and my sweet Love. I stopped by Tales of a Hockey Wife, where I found a GREAT post on dividing up chores with your spouse, which is something I find pretty fascinating! It's a great post - everyone should go read it! Then I clicked over to The Bird in Boots. She has one of the cutest blog headers I've seen. SO adorable! We're having a pretty simple Valentines Day - I think we're going to order pizza from our favorite local pizza place and watch a movie at home. We're not into braving the V-Day crowds at the nice restaurants! I stopped by The Bird in Boots and I loved her Valentine cookie cake! So creative. I also stopped in on Cornflake Dreams and I love her Oscars coverage. I'm not sure what our Valentine's plans are. The hubby asked me on a date so I'm excited to see what's planned. I went to Cornflake Dreams first, where she wrote a great post about past Oscars. Who can forget that swan dress, huh?? She also shared her Kate Winslet/Leonardo DiCaprio obsession, of which I can relate. Then I stopped by Tales of a Hockey Wife! Her blog features this great information about married couples sharing chores. I approve! The Bird in Boots - She has such a great header, and the cookie she made for Valentine's Day looks so yummy! Desperately Seeking Starbucks - LOVE the name and the look! My plan for Valentine's Day... peanut butter cups. Lots of peanut butter cups. Happy Vday!!! I stopped by Sweet Life loved her heart shaped pics!!! Also checked out Cornflakes post on the oscars which was fab:) I love this hop thanks for hosting!!! I just stopped by numerous blogs...The Bird in Boots, Cornflake Dreams, Happy Girl, and a few others. While I was reading, my son ate a gigantic chocolate heart...guess I should stick to reading when the kids are asleep! Such life in the Tropics made me want to move some where warm NOW!!! Totally fell in love with Relevant Notes. Super cute blog! Oops! Didn't mean to link up twice! I can't seem to figure out how to unlink... I visited 'Such Life in the Tropics'...her blog is great and I love the pictures! I also visited Blonde...Undercover Blonde whose blog is just too cute for words! I'm grateful for my wonderful boyfriend who drove me to the airport at 6 this morning and my wonderful mom who came and brought my flowers and took me out to lunch for Valentine's Day and my birthday! I visited Happy Girls are the Prettiest Girls and Blonde...Undercover Blonde...two very cute blogs I had never seen before. I love finding new blogs to read!! Happy Mingle Valentines! Today I visited Blonde Undercovered and she posted some things about herself, loved the fact that she loves Peonies. Also I visited Love Everyday and what a nice day to visit this blog with such a nice name. In my life I am thankful for each and every one of my relations even the most insignificant one because those might just be very important as well. Happy Valentine's Day MM Ladies & Gents! I checked out Greer's Gossip and her cute Valentine's Day ideas and photos! Love Everyday - checked out her adorable baby and his super cute outfit for his V Day photos! I visited Synfully Delicious, who lives in the great state of MN(same as me :D). I am her newest follower. I visited "laugh until your cheeks hurt" had she had pictures of notes from when her and her husband first started dating! My boyfriend has hockey tonight, so we celebrated by going to a movie over the weekend, and then we will go out for dinner tomorrow night. I am very thankful for my boyfriend, my family, my close friends and my little pup! Happy valentines day and happy Monday!! I stopped by laugh until your cheeks hurt and happy girl...both very cute blogs. I love this blot hop and love finding new blogs to read. See you all next week. I checked out Life in the Tropics--I really liked her photos. I'm jealous of where she lives (who isn't?) and she looks like one of those super-crafty people! And, she has a beautiful smile! Oh, and I'm thankful for all my loved ones near (hubby) and far (parents, grandmother, sister and her family). I just checked out Undercover Blonde. She has cute posts and her survey answers were fun to read. I visited Love Everyday and Laugh Until Your Cheeks Hurt.